Bigger dog with smaller dog? My husband and I are once again thinking about bringing a second dog into the household. Jager is going to be 9 months old on August 1. He is about 25 pounds and possibly 12-14(?) inches at the shoulder. 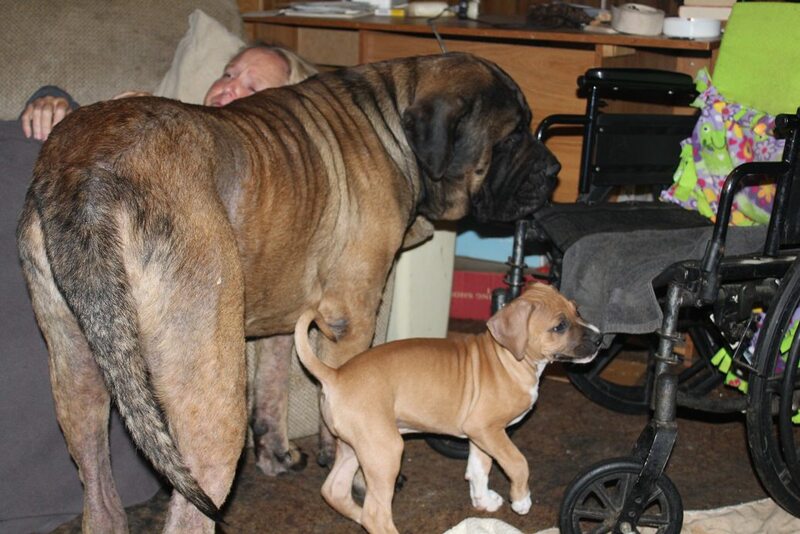 What advice do you have for bringing a larger dog in the house with a smaller one? I would love to have one of the mastiff breeds. I have researched them for years and have not acted on it due to some of the research results, i.e. they do not rehome well. We would not be looking into rehoming but we have looked into adopting an older Mastiff breed. I know this would come with challenges as well. We may, of course, get a smaller dog as a second dog as we are not choosy with breed. The dog needs to be good with other dogs and children. Any advice on the topics I have brought up would be great! Thanks! I truly believe that dogs do not have a concept of size. They "judge" who is what by far more subtle guidelines than mere size. Two dogs that we had together varied in height by 2 feet and the difference in kilos was about 40! Thus there should never be a problem with size difference - except for the obvious in terms of physics where a 45 kilo dog will obviously bowl over one weighing only 4 kilos during play and rough-housing. It's certainly possible to keep dogs of different sizes but with extremes you have to watch the smaller dog doesn't get bowled or knocked over. I think a lot depends on the individual dogs and you would really to check th e back ground of the dog you will be adopting and the dogs neet up to see how they get on. Some larger dogs may not be used to small or tiny dogs and need to learn how to play with them and adjust their behaviour. Slightly more seriously, my wife and I have considered geetting a companion for him. Out and about, he is perfectly fine. We can't be sure how he would react to another dog. It would be good if we could borrow a dog to test the waters. Thank you all for the advice! Jager is around my mom and dad's German Shepherd/Husky mix quite a bit. They play relentlessly until they are both tired out. I am just putting out feelers and we may get another smaller dog... Thanks again! As long as the Mastiff is not DA, you should be fine. 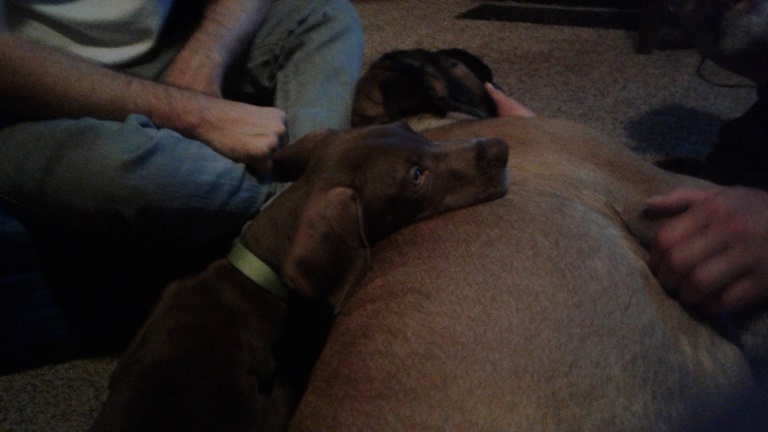 They know there size and are generally extremely gentle with little dogs. Most will actually lay on there stomachs and play with small dogs. Mouse used to have a shitzu he played with, and neighbor next to me has a chi, he will play with and generally he will stand still or lay down as they small dog runs around him and he will just move his head. So at 97 to 100kgs he used to play with a 4 or 5kg dog and a 3kg dog and has never stepped on one. 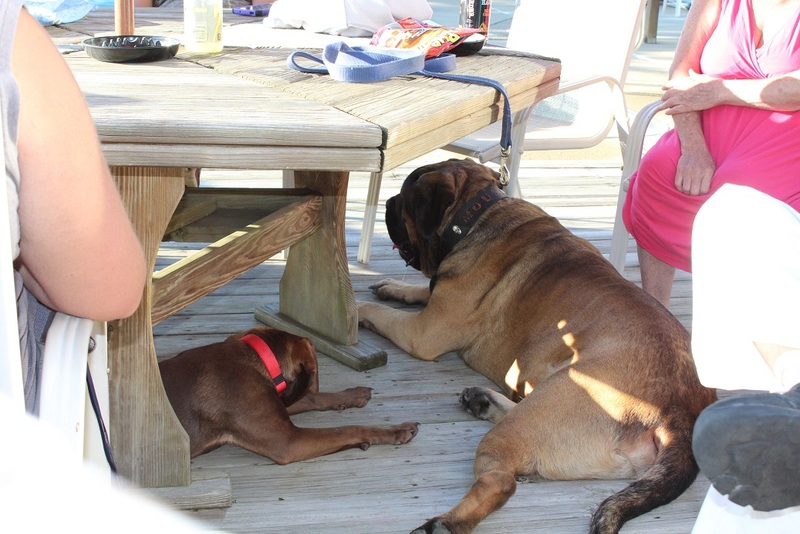 Mastiffs will adjust there play to the dog there playing with Mouse and Romeo will slam into each other with no regard when they play Mouse at top weight is 100kg and Romeo is around 110kg, just stay out there way and make sure there is nothing fragile around. With Loki friends Great Dane he will play rougher and do some body checking but nothing like when he plays with Romeo another Mastiff. Daughter has 2 French mastiffs and a Frenchie that's maybe 7kg there both around 64 or 65kgs and even when there playing hard there pretty careful when the Frenchie is there also. Biggest thing is just letting them get to know each other and supervising there play until they get to know each other. Mouse with Lil Bit when he was a baby around 5 or 6kg at time, Lulu Adult 15 to 20kg, Loki as a baby around 10kg at time, and Rosebud around 18kg at time. Played a ton with all 4, size was never a issue. It would depend on the temperament of both dogs. I recently looked after my sister's Border Terrier pup for three weeks while she was in France. The pup was just 11 weeks old (and tiny) and I have two large German shepherds. They were absolutely fine with her but I just had to be mindful of the size difference in any boisterous play. Oh my. 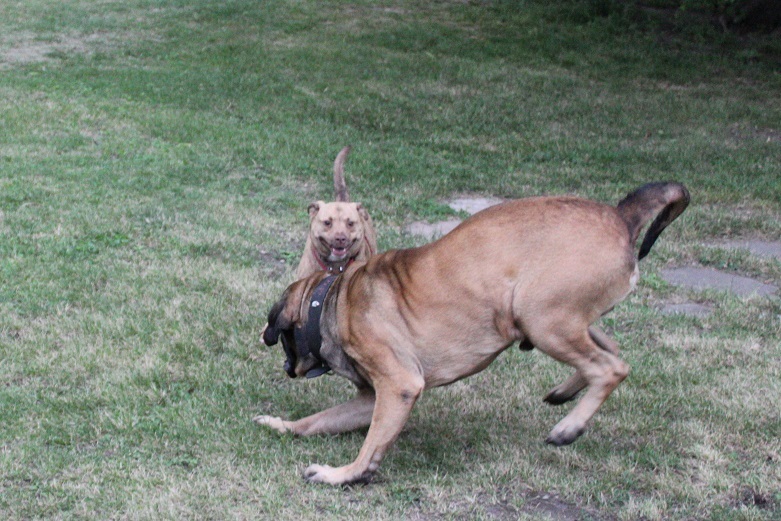 I love the pics of the Mastiff with the smaller dog lying on his back. So adorable. Thanks all who responded! Lots to think about!